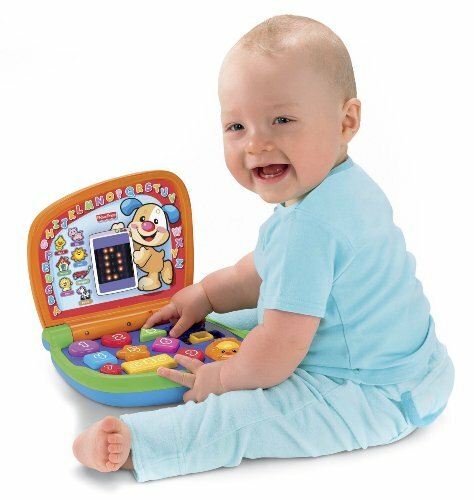 Power up a world of learning fun with a baby-appropriate laptop that's just their size! Nine colorful keys are easy to press, bringing learning to life on the animated screen so baby can learn numbers, shapes, colors, object names, initial letters, and more. Flip the lid open and closed, or bat and roll the mouse for alphabet fun! Plenty of sing-along songs, words, sounds and exciting activities, in both English and Spanish. Learning Time: Actions lead to learning! Baby gets responses by tapping keys, rolling the mouse, or flipping the lid open and closed to discover A-B-C's, counting and much more! Bilingual Learning: Learn numbers, greetings and more in Spanish, too! Musical Fun: 12+ sing-along songs and fun tunes, plus sounds and rewarding phrases.